Shrink N Repair Thin - Heat Shrink Wrap - Heat Shrink - Products - ZT | Zippertubing Co. This very flexible, thin-walled, wrap-around 2:1 heat shrink is the perfect choice to repair small wires or cables of any standard voltage with ease. Shrink-N-Repair® (Thin) will properly repair and protect your wires on any short-length wire harnesses, as well as charging cables and power adaptors for mobile phones, tablets and laptops. Other forms of heat shrink are tubular, which requires the user to either cut their wire or cable, or, if possible, to slip the heat shrink over their installation. Tubular heat shrink also may not be able to shrink completely over your installation and provide a proper seal around your electrical components. Zippertubing’s Shrink-N-Repair® (Thin) can wrap around your installation with no need to cut your wire or cable. Any broken, frayed or cut wire can be repaired quickly by simply cutting the right length of Shrink-N-Repair®, wrapping it around the wire and shrinking it with a lighter or hairdryer. 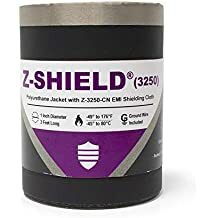 Add Zippertubing’s Z-Block heat-shrink electrical tape to any Shrink-N-Repair® installation to water-block or environmentally seal your application. 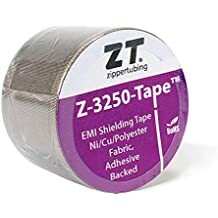 If you are looking to add extra EMI/RFI protection to your Shrink-N-Repair® installation, simply use Zippertubing’s Z-3250 EMI shielding tape in combination. Great to repair wires or cables with a diameter of 0.05” to 0.25”! Shrink-N-Repair® (Thin) will fit up to 16 gauge wires without insulation. For larger wire or cable diameters, try our standard Shrink-N-Repair® which wraps around wires that are up to 0.5” in diameter. If you are trying to find a solution that will wrap around wires larger than 0.5” in diameter, give us a call at (480) 285-3990. We have a solution that will fit your needs! Shrink-N-Repair® (Thin) Wrap-Around Heat Shrink is an excellent preventative measure for any of the above items to reduce wire or cable strain before they even begin to show signs of wear. Proper maintenance can prolong the useable lifetime of your device, plug, wire or cable.